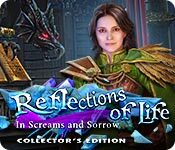 Reflections of Life: In Screams and Sorrow Collector's Edition is rated 2.6 out of 5 by 21. 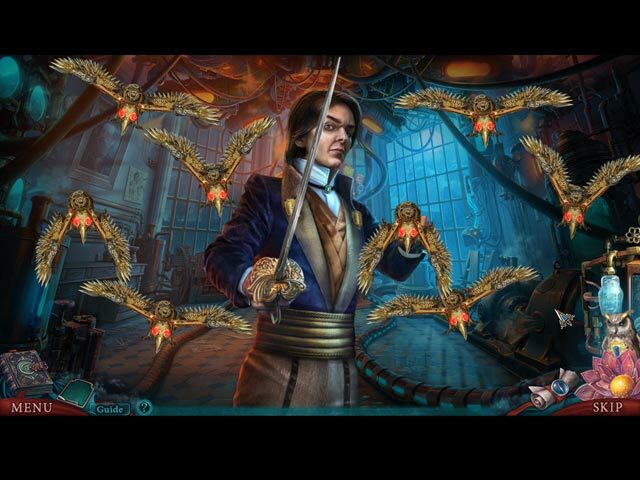 Rated 5 out of 5 by chrmn2k from Best Hidden Object game ever! I can't believe the low ratings, so here's mine: I played it for fifteen minutes and then bought it! It is far above average in HOGs, in my opinion. The games were unique and varied - right up my alley. Sure the storyline wasn't exceptional, but the audio and video was. Give this game a decent try. I feel confident that you will not be disappointed. Rated 5 out of 5 by rainworm from Healer and detective - Cure the disease, that struck, when opening the portals and find the one, who is behind it We play as Elva, a graduated pharmacist. Our friend Michael has called for our help in optimizing a cure for Senekta, a mysterious disease, which came with opening of the portal to parallel worlds. Infected people grow old rapidly and only humans are affected. Henrik, ruler of one of the cities, offered medicine in exchange for young men for his court. But the medicine does not work and people are not really prepared to lose their sons. In this weird situation it will be our task to help with a working cure. But it is not only the epidemic, that rises problems. Henriks guards act aggressively against all, who resist his dictate. Is he behind the ‘occurrances’, that happen in the following? Michael receives a package from a friend, and is infected by the contents; his colleague Nova is abducted …. We have a lot to do in this longer game, where we will visit the parallel worlds to free Nova and uncover the dark forces behind the epidemic and all other attacks. A discreet helper, an owl, will assist us – sort of accessory of this series. As it is helpful and not asking for attention, a feature, tolerable for all players. Visuals are high standard, music is suiting, HOS are variable and partly creative though puzzles more on the easy side. All in all a very good performance and – after rather short games lately – a longer journey into fantastic worlds. Rated 4 out of 5 by glaeken from Where's Grace? This is the third Reflections of Life missing the Guardians. After playing the previous two Reflections in the series I was excited to see a Guardians picture. I thought "finally"! Nope, you play as a scientist. The owl is the consultation prize for the disappointment. So where's Grace? In the bonus chapter. I felt cheated. The game was a fun way to spend some time but I didn't like the story premise. I found it somewhat disturbing. I'd already bought this on sale based on my love for the series and a buy one get one free. I probably should have played the demo first. If I had I wouldn't have bought it. Only worth a CE price if you want to see the reason this series became popular in the first place. I really wish they would stop releasing games named as Reflections of Life if they are not part of the series. I want to return back to those worlds and I want to see Guardians with owls. Rated 4 out of 5 by Majestyx12 from Architecture Beauty Based on the finished game and bonus content I bought this game without trying it. I thought the beginning was hard, like going up hill. If I just trialed it I wouldn't have bought it. Later I was glad I bought it. It was like a normal game, I would Love. I like my games relaxed and not difficult. I buy for the story and hops. Since I finished yesterday I had a picture of the black haired girl with the roses on either side of her head on my PC. I really like some of the 14 wallpapers. Next wallpaper, I'll use would be the architecture beauty, building with the domes. I liked the interactive hops. Some are used more than once and I didn't mind. Some hops had multiple steps. I really enjoyed the one with the daffadils. For details- I liked the oriental flair, the architecture, all the roses, 2 moons and clockwork mouse and mechical cat. 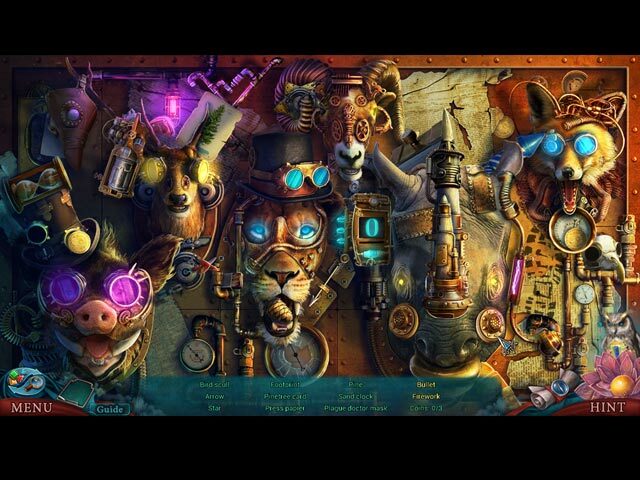 For the puzzles I loved two mazes and in the bonus chapter I liked putting together multi colored glass to make different animals. ( Kind of looks like beach glass) I collected 102 Love Letters. Three per scene. So you know there are lots of scenes. I didn't play staight through and I went to the collectibles in the bonus content and picked up some of the ones I missed before continuing. Except I couldn't pick them up in Kurtz's shop, so I waited and later in the bonus chapter I was back at his shop and pick up three and went to the collectibles and pick up the one I missed. Since I had all of them. It opened a hidden puzzle, which I think is more hops like, so I loved it. The bonus chapter is a continuation of the story. Replay 18 hops, 8 mini-games, 26 movies, 8 music. Achievements, 11 concept art and 14 wallpapers. I think the achievements look pretty. 7 chapters+ bonus. Rated 3 out of 5 by dancemom1 from Move on already! Hello friends! As always, I review on the game play and let others review on the story line, as they are much better at that than I am. Looks like this might be #6 in this series. I don't have them all, but I do have a couple. This one started out promising, but quickly seemed to go downhill. The graphics weren't too bad and I didn't notice much in the way of blurring in the scenes. The colors were somewhat muted with hints of blue and purple, which is quite tiring on the eyes. Game play was good, with no glitches or problems during the demo. Voices were well done and fit the character and age, with some emotion as well. I did note that we could not click through dialog, most of the time, if we read faster than they speak. Some dialog was much too wordy, and not necessarily all that helpful. Sound FX were quite well done when we had them. Seemed to have a lot of bird noises. Animation was very good. Again we have a helpful owl goes to locations we can't reach. HOPs were a mixture of silhouettes, place object in scene and interactive lists. Items were not difficult to find. Again, we play the same HOP multiple times and don't seem to move to new areas very quickly. This gets very boring very quickly. You can also switch to a match 3 game if you get tired of the HOPs. Puzzles were extremely simple and took no time or thought to complete. Hint system was very helpful, but I spent so much time in just a couple of locations, I don't know if we have the transport feature or not. However, there is a jump map just in case. Collectibles were very disappointing. We only need to find "love" letters, which are actually envelopes with a red heart on them. So far, I have found three in each scene. They are plenty large enough to see and quite easy to find. Definitely needed more in this department. I try very hard to get completely through a demo before I comment on a game. However, I just couldn't do it this time. The story moved so slowly, and we spent so much time in one or two locations, that I got bored and couldn't go on. This game is nowhere near challenging. If I don't care for a game, I at least try to find something positive about it for others who might like it. I think I did that above. However, if you are looking for a good story with enough action to keep you interested and moving, this is not the game for you. I'm sure this will appeal to beginners, but I doubt a seasoned gamer would care much for it. When I beta tested this one, I gave it a 3.5 on my scale, but think it's more like a 3.0. I will recommend for beginners, but this one has nothing that makes me want to get it for myself. No purchase for me. As always, try it for yourself and see what you think. We all have different tastes in games and you may find this to be exactly what you are looking for. Thanks for the reviews. Play on! Rated 3 out of 5 by sunnyglow from DON’T WANT TO LOOK YOUR AGE? TRAVEL TO A PLACE WHERE APPEARANCES CAN BE DECEIVING REVIEW BASED ON THE ENTIRE GAME 7 Chapters Plus a Bonus Chapter – Strategy Guide: 53 Pages – Time: 4 Hours Main Game OVERVIEW/BACKGROUND: Congratulations Elva! After graduating from pharmacy school with honors, you are off visit your friend Michael. However, upon arriving you are shocked at how much he has aged. He is suffering from a disease, Senetka, which was contracted by the people of his village with the opening of a parallel universe. From this other dimension entered Henrick, an alien offering a cure for the ravages of this disease. However, when it appears the antidote is not working, Michael asks you to develop an antidote which will work. Now under Henrick’s direction, children are being kidnapped. What is the true intent of Henrick? Is he a friend or foe? You are off to this parallel universe to develop an antidote for this disease all while investigating what Henrick is up to. You will get a little help from friends, however. Michael, his wife, Nova, and others will join you in your quest to save your people. 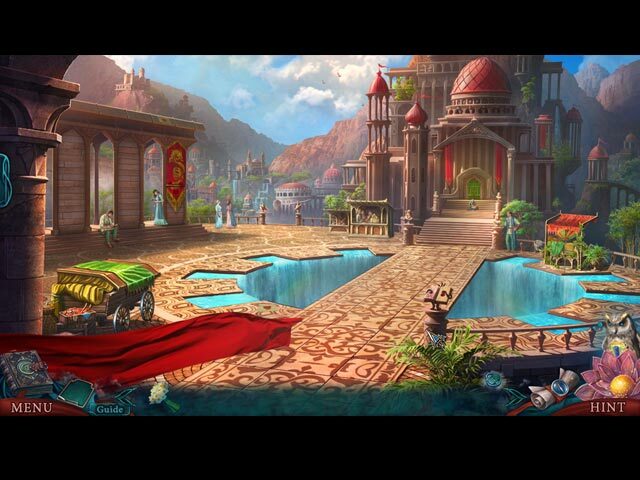 RECOMMENDED WITH RESERVATIONS: This is a great game for those who love fantasy games. Although it deals with parallel dimensions, it is not a sci-fi game. It is more of a fantasy game. Unfortunately, I was not enamored by this game. I purchased this game and then regretted it. Playing this game was tedious. I found the pace slow. You ramble between two parallel universes traveling from city-to-city seeking an endless number of inventory items. You use those inventory items to search for even more items. There is not much to the story behind this game; there is very little dialogue. I got tired of travelling back-and-forth collecting supplies. I felt the graphics were decent, although blurry in some places. Throughout the game you will hear dogs barking. In the last chapter of this game, the constant barking of dogs was nerve racking. With all the shorter games of late, it is a rather long game, so you do get your money's worth. However, the quality here does not match the quantity. AN OWL WHICH IS A HOOT! There is a helper owl within this game. I dislike helpers in games and his presence in the game is somewhat erratic. He is used eight (8) times in the demo, which, for me, is excessive. All he does is fly to some location and flap his wings back-and-forth. However, after the demo, he is hardly used at all. MECHANICS: There are not many collectibles in this game. There are no morphing objects. There is only one collectible – love letters. There are one hundred two (102) love letters to collect. Wow! They are everywhere in this game and some are easy to locate, and some are not. How this collectible relates to this game is beyond me. You must collect all of them to uncover a hidden puzzle at the end of the game. There are fifteen (15) achievements to collect (from what I could count). You can replay seven (7) mini-games and fifteen (15) HOP scenes from the main game. Since I did not finish the bonus chapter, I have no idea how many of those there are from that chapter. BONUS CHAPTER: It is a sequel. Kurtz, Michael’s friend is missing. You are off to locate him. From the short time I played into the bonus game, this chapter appears to be of the same caliber as the main game. HOP SCENES: There are nineteen (19) HOP scenes in the main game. The scenes are standard ones seen in most games. Most of the scenes are standard lists of items requiring little interaction with the scene. There is little creativity in design. Most of the scenes are not thematic – just a random assortment of items. With the slow pace and lackluster HOP scenes, this game is very boring. The only ones I enjoyed in the game were the search-and-replace scenes in which you locate items and replace them back within the scene. Scenes are reused within the game as well. You can also play a Match-3 game in lieu of the scene. PUZZLES: There are twenty-six (26) puzzles in the main game. The puzzles are variations of ones seen in most games. Most are easy. Many are not thematic and lack creative design. There are two which I did enjoy playing. Both are maze puzzles. The last puzzle is a super puzzle. However, I feel this super puzzle, containing three (3) mediocre puzzles, has nothing to do with the theme of the game. In general, I was not impressed with most of the puzzles. SPOILERS: HERE ARE SOME OF THE PUZZLES AFTER THE DEMO: A. Ye Olde book puzzle. Place books in correct order according to a given illustration. B. Maze puzzle. Maneuver two keys so that they reach their locks at the same time. Moving one moves the other. Avoid vortexes which send you back to the beginning. C. Maze puzzle. Move through a cloud-covered maze moving to locations indicated in a storybook. D. Ye Olde Rope puzzle. Untangle ropes by switching nodes from the rope. E. Place nine items into slots in a box by row and column so they match up by type and color. F. Best puzzle in the game. Maze puzzle. Lead your character through a maze. You will need to avoid watchdogs and locate colored keys to open matching colored gates as you try to reach the exit. Rated 2 out of 5 by Yurnmesis from Trial: Lots of Back and Forth. Frustrating and Confusing! Into the trial 37 minutes and it froze, so I just quit. I suggest you take advantage of the trial to make your own decision, but I'm not going to purchase this game. I'll just pass on a few observations as others have covered the main points. I dislike a lot of back and forth in any game and this one has way too much of that. The story is rather predictable and nothing new. Tired of someone dying and must race around for what seems like ages to find the items, potions, etc., to save the person. I find that frustrating and annoying. The characters were okay but some seemed out of place for the time and locale and I felt like someone dropped the ball on that continuity. I wasn't sure if I was in a rural village, small town or large city based on some characters and locations. it just seemed disjointed. Some of the voice overs were over the top. Just didn't pull me into the story because it seemed all too familiar as well as the above factors. Rated 2 out of 5 by JAGgirl from Not like the previous games :( Very disappointed with this game. A definite step down from their previous stories. Sorry I wasted game credits on it.